I don’t know about you, but if I’m not careful, a lot of my weekly budget can be spent on food. I love cooking and trying out new restaurants and cafes around town. But food can get pricey, especially if you shop at expensive groceries stores and eat out all the time. That’s why I want to tell you how to eat healthy on a budget! There are certain things you can do on a weekly basis to ensure that you’re not spending the bulk of your pay cheque on food. From batch cooking to buying in season and making a grocery list before going to the store, all you have to do is be more mindful. Thinking about what foods your body really needs and how you can get these foods more frugally is all it takes. 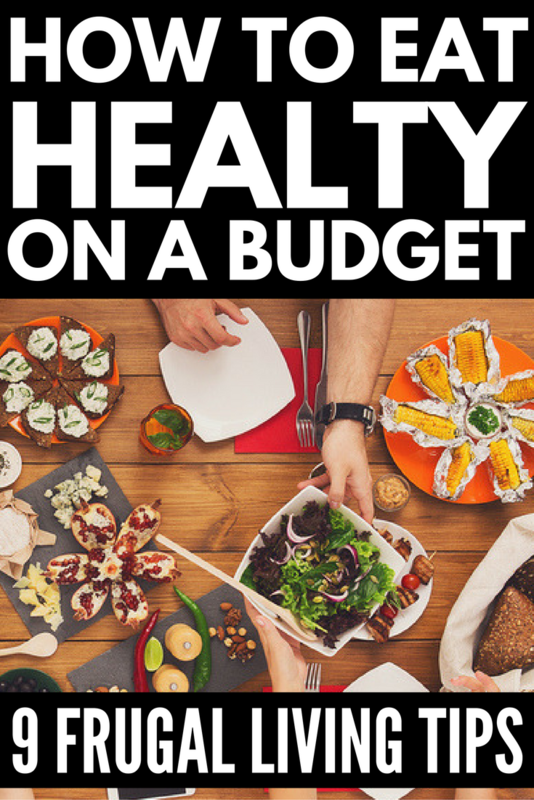 There are a number of ways to eat healthy on a budget, and I’m sharing by best tips with you! Batch cooking is one of the best ways to eat healthy, save money, and have more time at the end of the day! You can batch cook and freeze a week’s or month’s worth of food so all you have to do each night is heat it up. This way you can make sure you’re getting the right amount of protein, veggies and everything else you need in your future meals, and stops you from eating out on the way home or popping in a microwave dinner. Batch cooking does require some planning and prepping, but it’s totally worth it! The Batch Cookbook not only provides you with awesome recipes, but will also give you tips and techniques for batching your meals. When you eat out often, it accounts for lots of your hard earned money being spent on food. And it’s not always the healthiest foods, either. Making your meals at home is much more cost efficient, and you’ll know exactly what your putting into the meals you prepare. If you’re someone who eats out for the majority of your meals, think about how you can change this. Is time the problem? Try batch cooking your meals on Sunday night. Do you think you’re an awful cook? The 15-Minute Meals Cookbook will help you out with that – it’s filled with delicious and easy meals that anyone can make! Do you know that grocery stores change their prices depending on where they’re located? So if you shop at a grocery store in a nicer, more expensive area, they jack the prices up. My jaw hits the floor when I see how expensive groceries are sometimes. $6.99 for a ½ pint of raspberries? It’s bonkers! Then I visit Chinatown, which is right down the street, and the prices are so much more affordable, and the quality is just as good, if not better. There’s no need to waste your money at expensive grocery stores that inflate the prices. Finding local groceries is one of the best ways to live more frugally. Buying out of season fruits and veggies always costs more, due to the costs of transportation and energy. If you’re not sure when certain foods are in season, do some research in order to spend less and stay on budget. Plus, in season foods always taste better anyways, so it’s a win-win. I’ve definitely been guilty of this one. Popping into the grocery store and picking up a container of pre-cut fruits or a premade pasta for $11. Then I get home and think to myself, I could have bought ingredients to make this for less than that and then had some left over. Sometimes premade foods seem like the best option because we’re feeling really hungry or lazy, but you can save a lot of money by making it yourself. Plus, it will taste better. Foods packed with fiber and protein are not only good for your health, but they help you stay full for longer, which means you don’t have to eat as much. Whereas foods like cheese, pastries, and sodas offer empty calories with little nutrients, fiber and protein rich foods ensure you aren’t hungry ten minutes after you eat. Do an analysis of the foods you eat most. If you find yourself hungry after most of your meals, you probably need to eat more foods that are nutrient rich and keep you satisfied for longer. This will keep you healthier overall and ensure you’re not snacking on junk foods throughout the day. Without a shopping list, you’re more likely to pick up random foods you don’t need. Figure out what you need for specific recipes or batch meals for the week. Make sure to check your fridge, cupboards and freezer to ensure you don’t buy doubles. You can also budget your shopping trips more easily this way. Stick to your shopping list at the store and resist the urge to buy things you want but don’t need. Another tip I’ve found to be very helpful is going grocery shopping when you’re full. Whenever I’m hungry at the grocery store, I end up buying unnecessary things and spending more money. If you see one of your favorite healthy foods go on sale, stock up! It may feel like you’re spending a lot of money, but it will save you money in the long run. For example, if you love blueberries and see them on sale for $1.99 and they’re usually $4.99, you can buy them in bulk and freeze them! Buying local is so much healthier than buying at the grocery store, and while sometimes local foods can come at a higher price point, waiting until the end of the day at the farmer’s market can work in your favor. At this point, vendors are more likely to negotiate a bit more because they want to share their products rather than have a big stock back at home. Eating healthy on a budget doesn’t have to be hard! Start implementing these tips and start living more frugally today! If you liked these tips for how to eat healthy on a budget, please share it on Pinterest! And if you’re looking for more healthy eating tips, please follow our Health board on Pinterest!